Deric's MindBlog: Status and the brain. Social hierarchy is a fact of life for many animals. Navigating social hierarchy requires understanding one's own status relative to others and behaving accordingly, while achieving higher status may call upon cunning and strategic thinking. The neural mechanisms mediating social status have become increasingly well understood in invertebrates and model organisms like fish and mice but until recently have remained more opaque in humans and other primates. In a new study in this issue, Noonan and colleagues explore the neural correlates of social rank in macaques. Using both structural and functional brain imaging, they found neural changes associated with individual monkeys' social status, including alterations in the amygdala, hypothalamus, and brainstem—areas previously implicated in dominance-related behavior in other vertebrates. 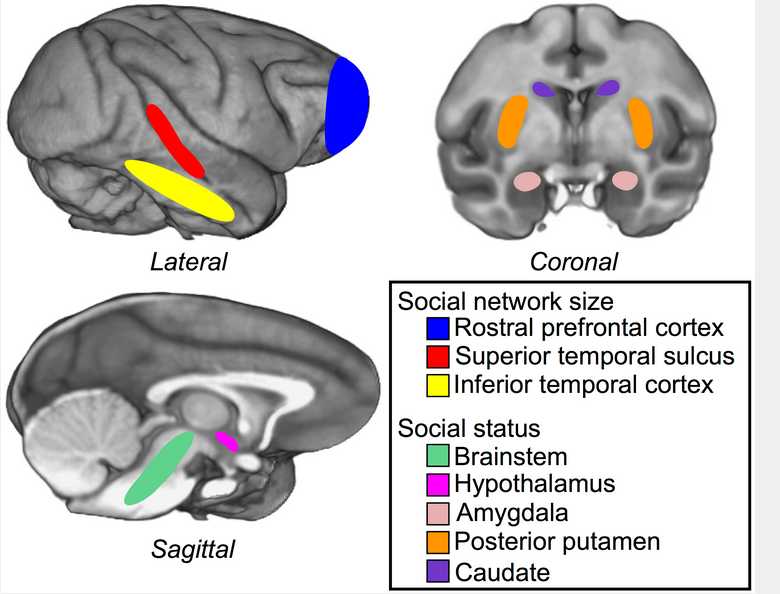 A separate but related network in the temporal and prefrontal cortex appears to mediate more cognitive aspects of strategic social behavior. These findings begin to delineate the neural circuits that enable us to navigate our own social worlds. A major remaining challenge is identifying how these networks contribute functionally to our social lives, which may open new avenues for developing innovative treatments for social disorders.